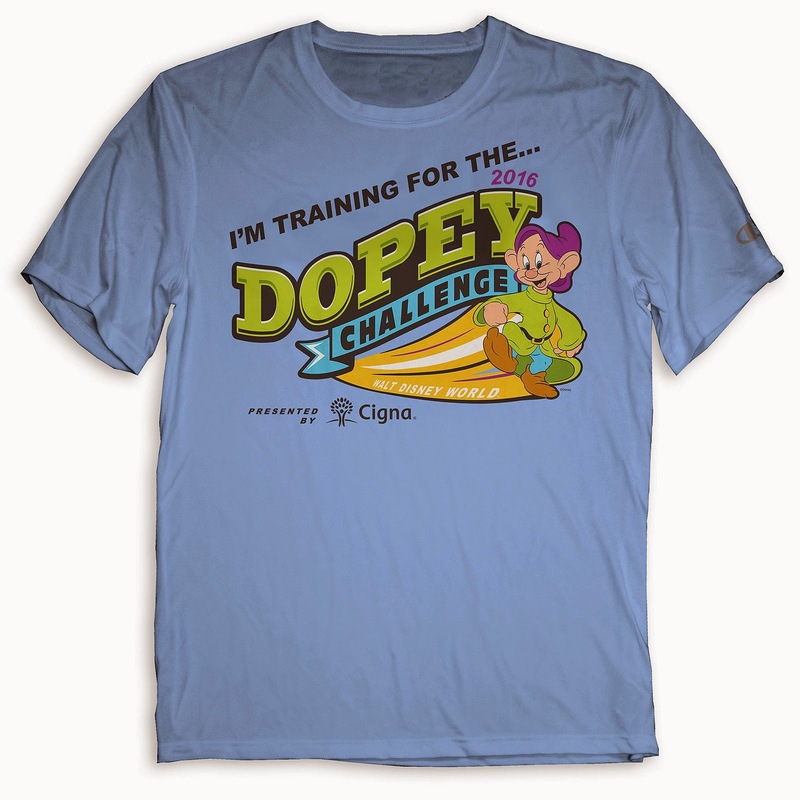 The Dopey Challenge is a 48.6 mile run event that takes place each January over four courses through the Walt Disney World parks. For a limited time (April 28 - May 7), this 2016 "I'm training" tee is available online at the Disney Store. Polyester. Men and women sizes, retail $36.95. Child size, $32.95. Item Nos.Item No. 7405056321617M + 7407056321619M. 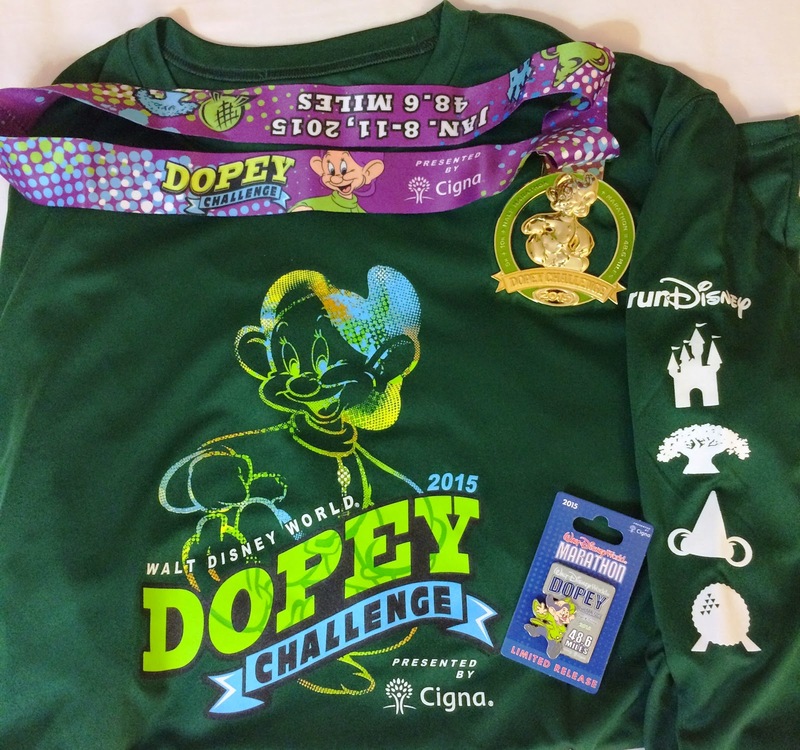 And from the Travel On A Dream blog, we get to see what the 2015 shirt looked like, plus a participant lanyard, metal, and pin. 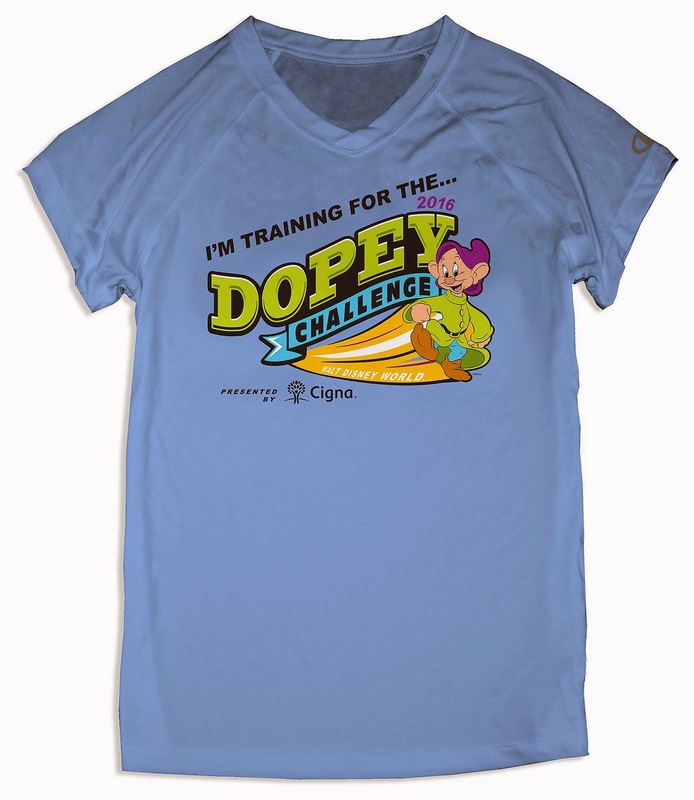 Also see the 2014 Dopey Challenge tee in an earlier post. 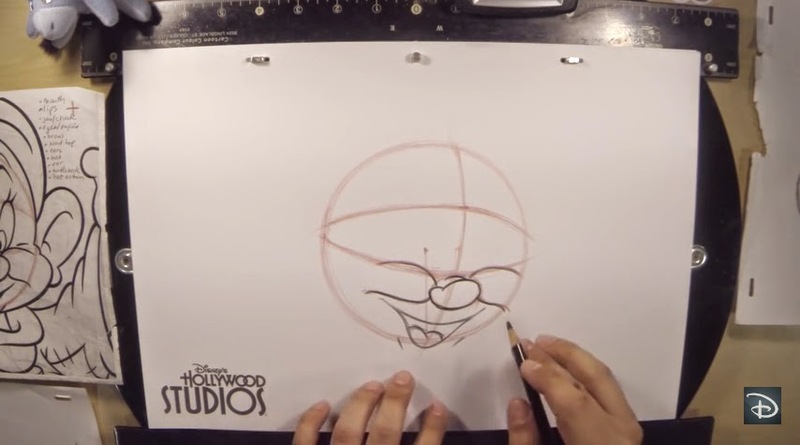 On April 2nd, the Disney Parks Blog posted a video tutorial on how to draw Dopey. Special thanks to 1937fan of Whistle While We Blog for the notification on this video. 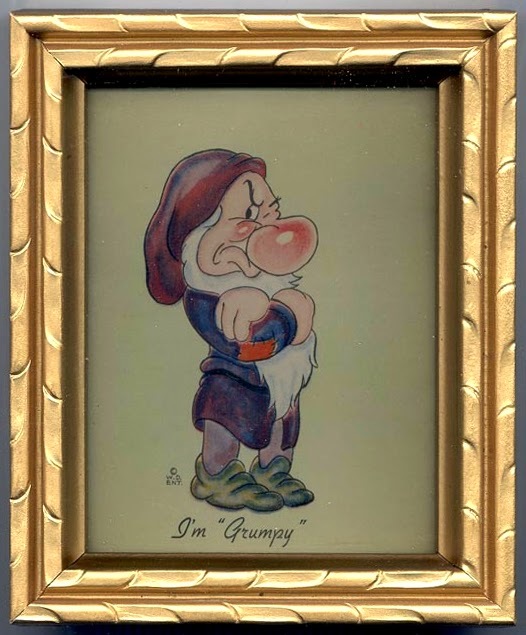 Also see the Grumpy tutorial from last year. 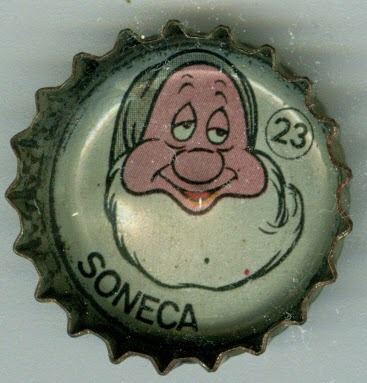 A series of Disney character Coke bottle caps were issued in Brazil in 1977. In small print along the inside rim is the year and "© Walt Disney Productions". 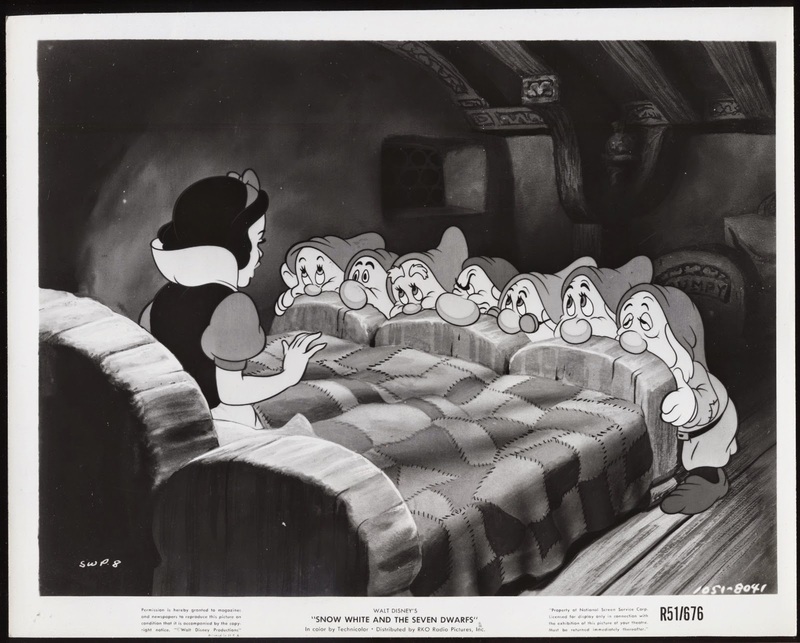 Snow White and the dwarfs were included in the collection with their names printed in Portuguese. Each is numbered. 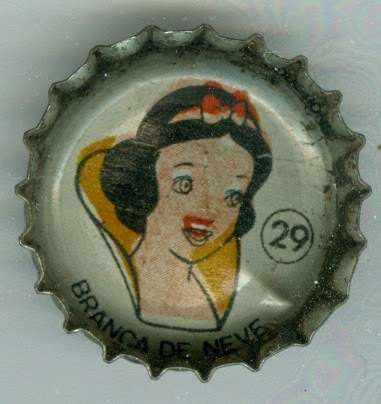 Branca De Neve is #29. 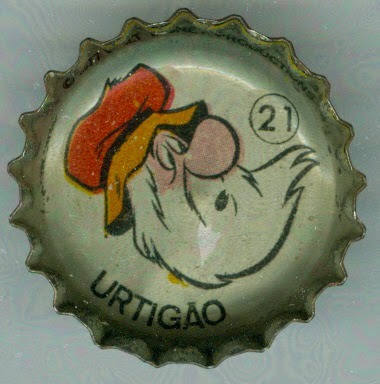 These particular caps come from collector Brian Main, who says his set is not yet complete but that there are at least 72 in the series, based upon the highest number he has. 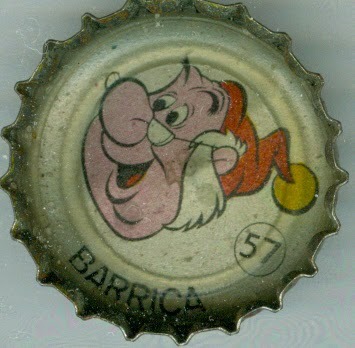 A few other examples include Urtigao #21, who was popular in Brazil and found in Donald Duck comics; Barrica (Mr. Smee) #57 from Peter Pan; and Mickey #60. Additional Mickey image via ldrbryan. 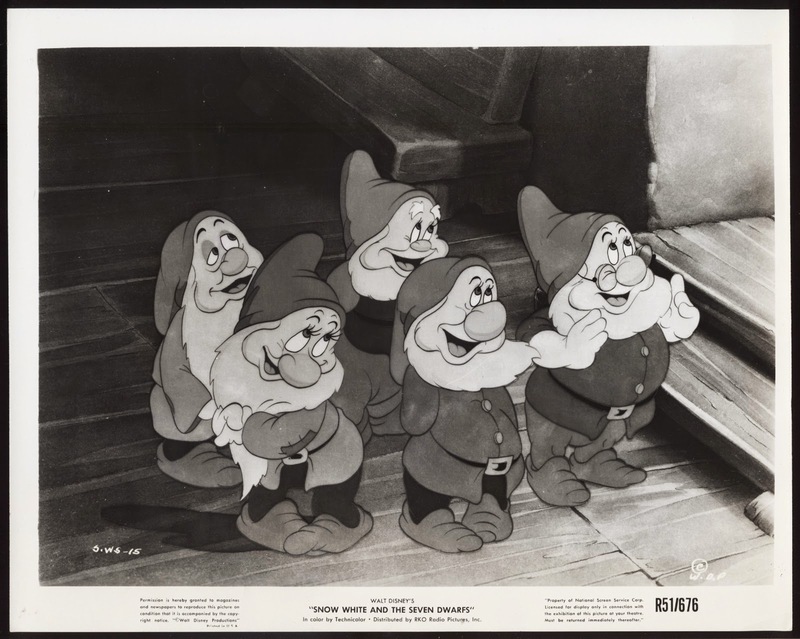 We're still missing four of the dwarfs in this collection. If anyone has pics they'd like to share, we'll be happy to add them and give you credit. 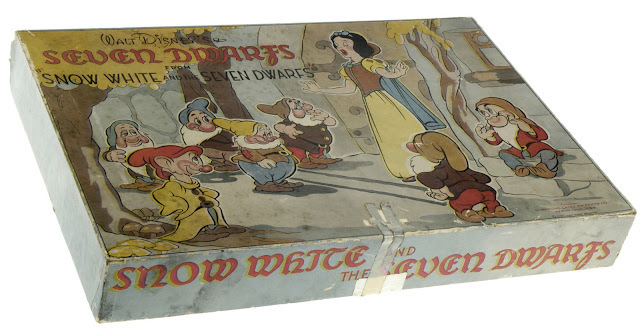 I came across this Snow White player piano roll on ebay awhile back, and at first, it seemed like this could be quite the vintage find. 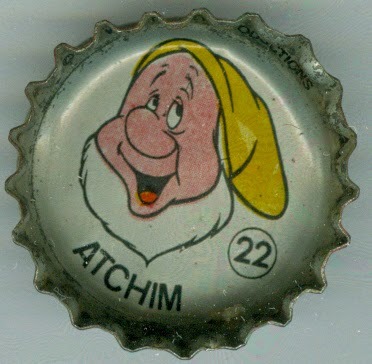 After all, they don't make these things anymore, right? Wrong! 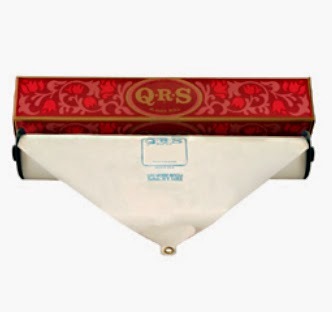 According to their website, "QRS has been manufacturing piano rolls since 1900 and is the only manufacturer of piano rolls still in business today." This particular roll, catalog no. 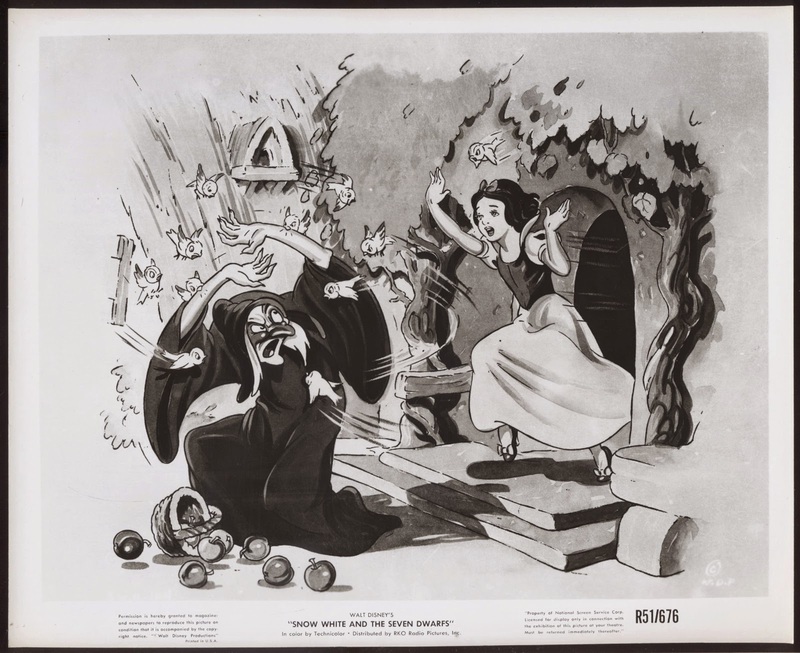 XP-146-B, features a medley of six Snow White songs, though it's not indicated which titles are included. They were performed by Doug Roe, a now-deceased recording artist and arranger for QRS. Doug Roe with the piano roll machine. Image via AMICA. Searching the QRS website today, we find that a very similar roll to the one above is still available (catalog no. XP-146; retail $25). 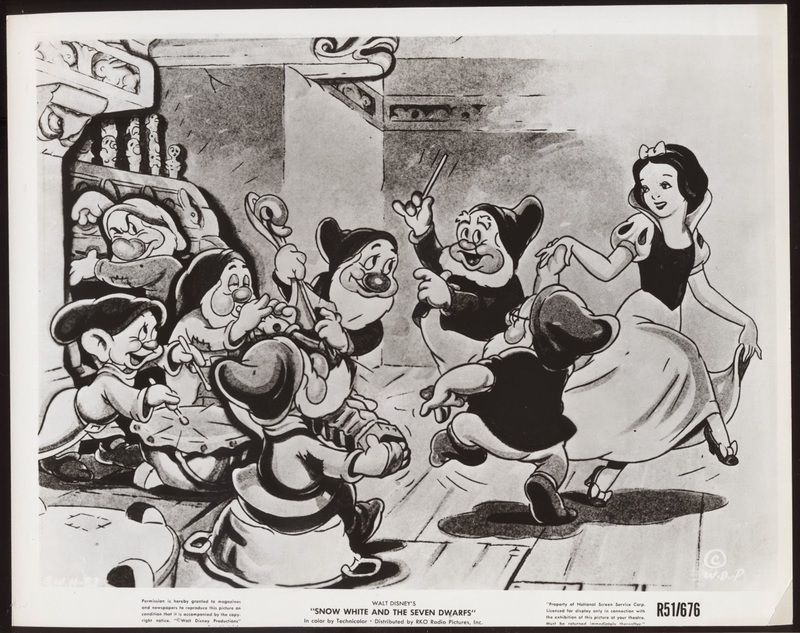 It features a medley of seven Snow White songs: 1. Whistle While You Work; 2. 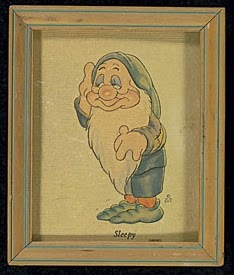 Heigh-Ho; 3. Someday My Prince Will Come; 4. One Song; 5. With A Smile and A Song;. 6. I’m Wishing; 7. Bluddle-Uddle-Um-Dum. There's also a solo roll that plays Someday My Prince Will Come (catalog no. 6826; retail $15). And one more quick search on ebay revealed an older roll, also produced by QRS, but performed by Lawrence Cook. 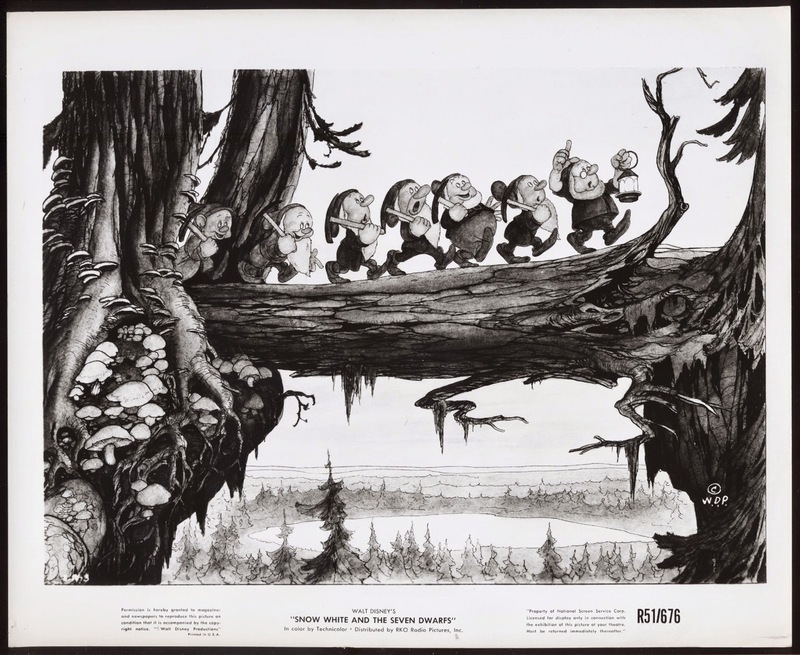 "Heigh-Ho" (The Dwarf's Marching Song). Catalog #6814. Lawrence Cook was "the most prolific piano roll artist in history," producing an estimated 10,000 to 20,000 different roll recordings. He passed away in 1976. 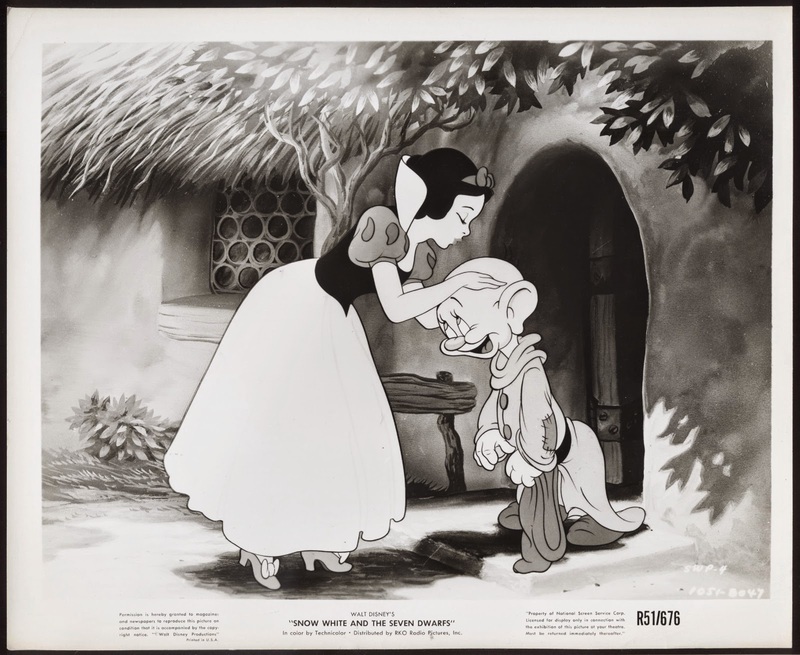 The 1952 US theatrical re-release of Snow White occurred on February 13th of that year. 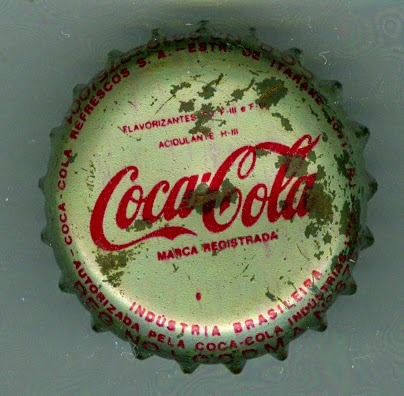 However, the promotional materials for this campaign were issued in 1951 and thus are dated so, "R51". The following is a series of 10 press kit 8x10 photos (glossy B&W). 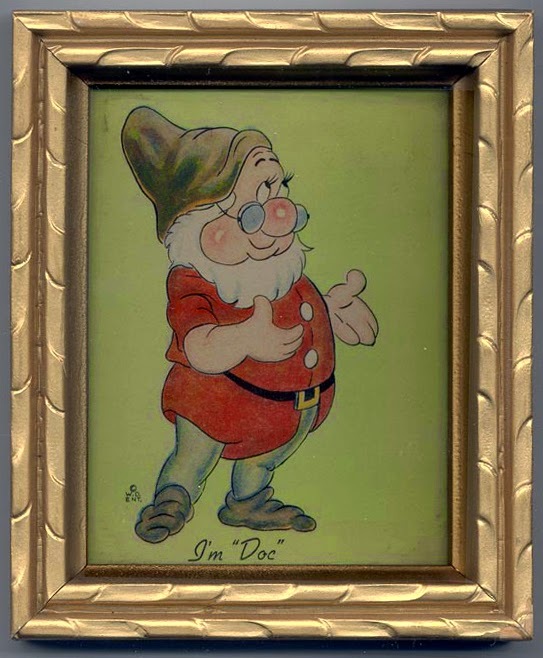 Images courtesy of Rick Payne of dadric's attic. 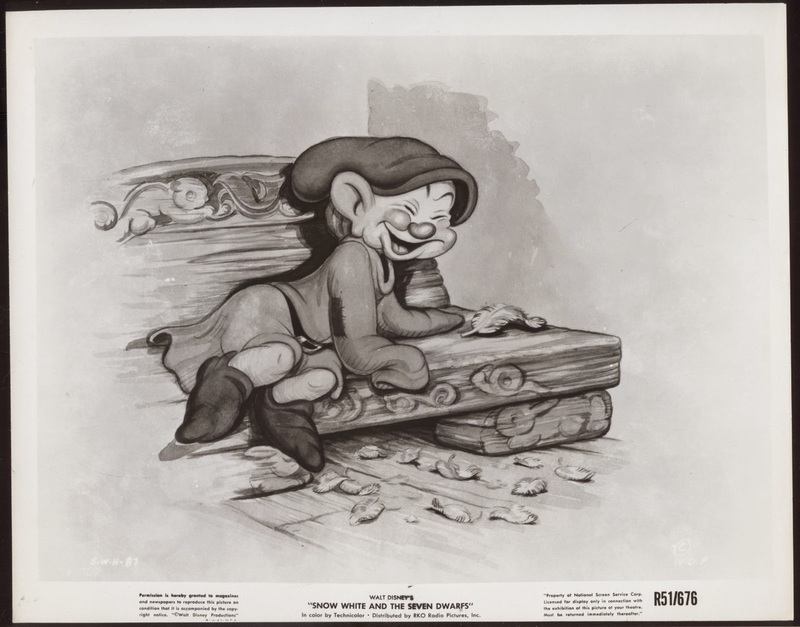 Over the years, all of these classic images have been utilized by Disney in a myriad of ways, e.g. storybooks, puzzles, greeting cards, clothing items, and much more--including press kit photos for other re-releases. A fabulous boxed set of the Seven Dwarfs, manufactured by the Seiberling Latex Products Co. of Akron, Ohio. 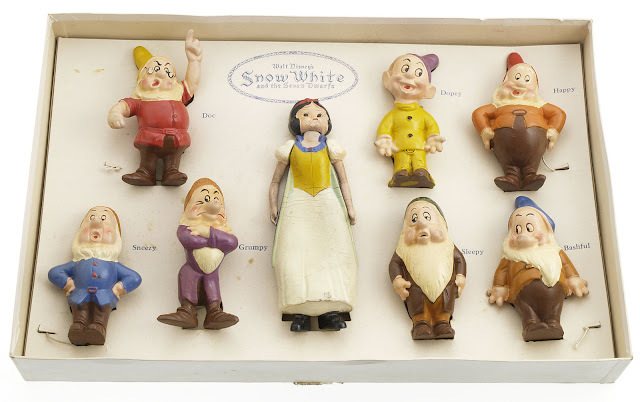 Includes all seven original solid rubber figures. These guys spent their lives inside this box. Some of best preserved figs ever seen. 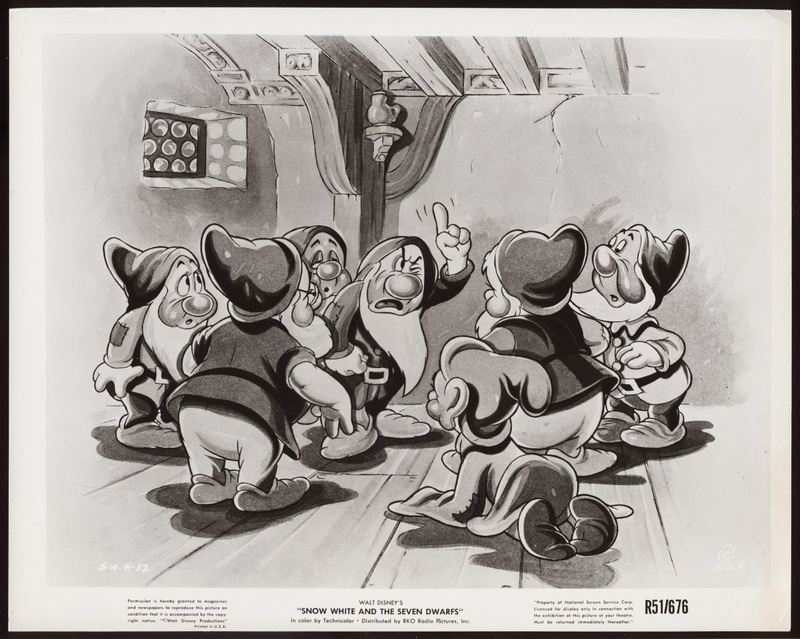 Box imprint reads, "© 1937 WALT DISNEY ENTERPRISES." A similar boxed set appeared in the 2012 Animation Auction Catalog from Profiles in History. While it has the same cover, it differs in that it also includes the hollow rubber Snow White figure. 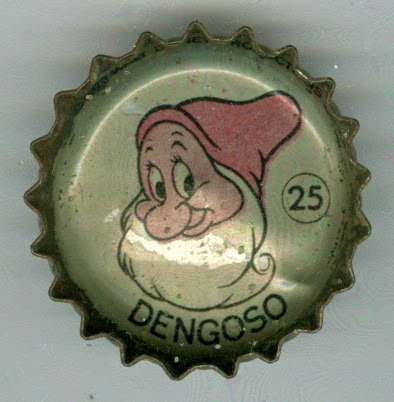 The catalog states that this one dates from 1939. 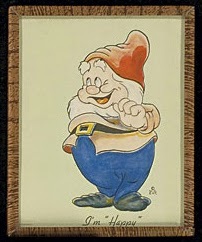 The set was offered by Heritage Auctions in May 2005. 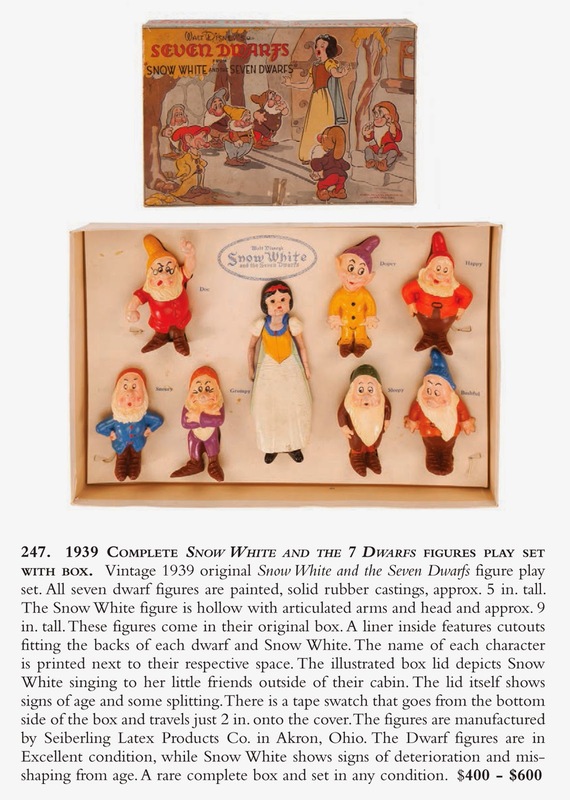 See an earlier Archive entry for much more detailed information on these Seiberling latex figures. 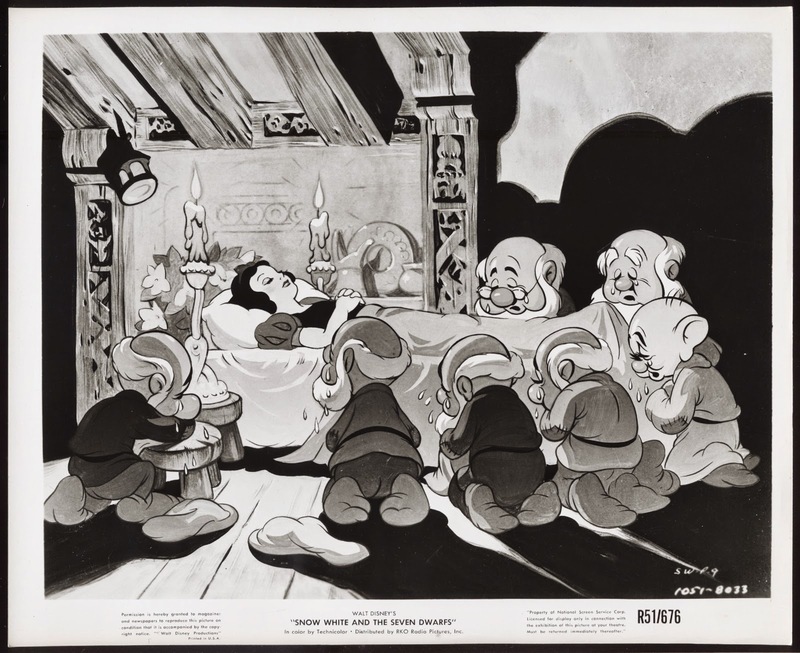 A series of eight color prints featuring Snow White and the Dwarfs was issued in 1938. Each is marked "© W.D. Ent." 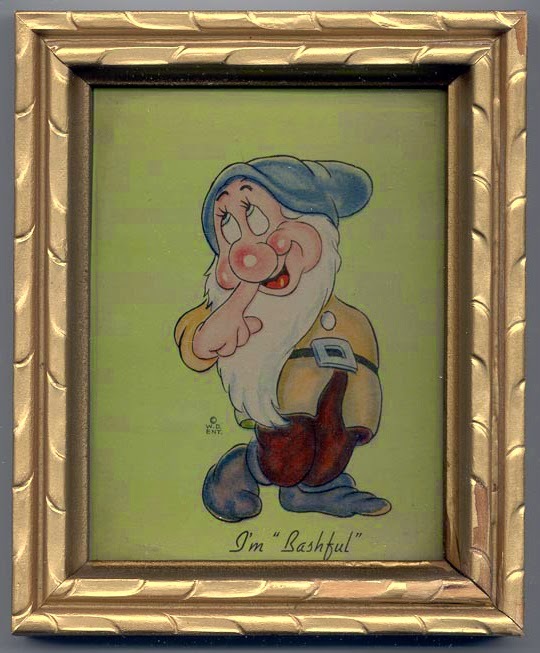 The framed pictures with glass were available for purchase by the public, and were also used as promotional give-aways, such as in the Jingle Club bread campaign. 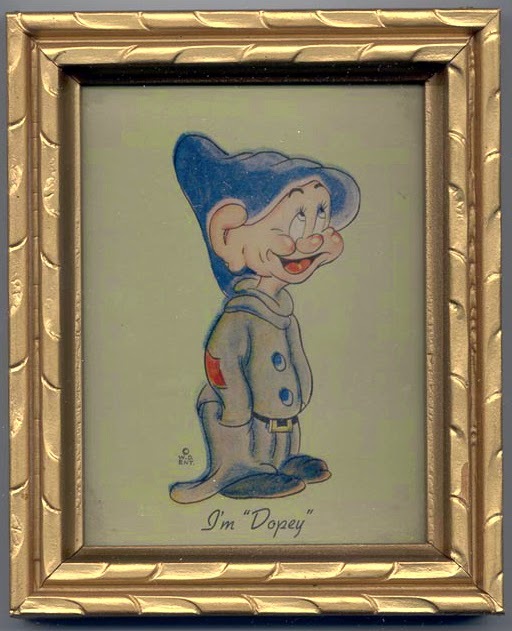 The pictures were offered in a various fancy wooden frame styles. Measures 5.25" x 6". 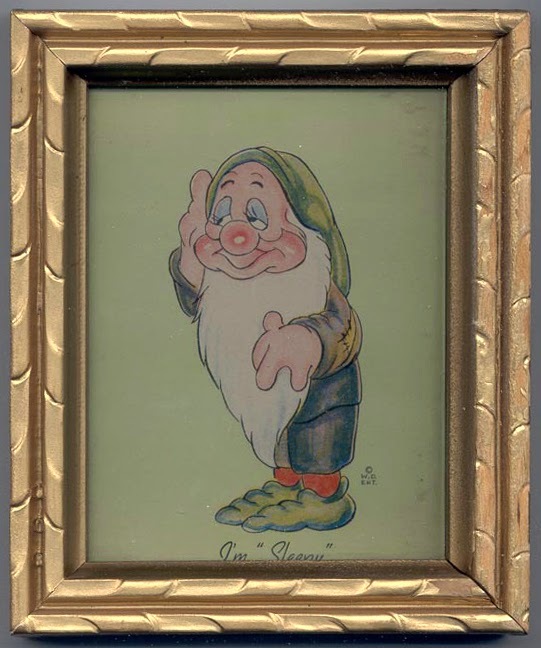 Fancy frame pics via iskowitz rare coins. 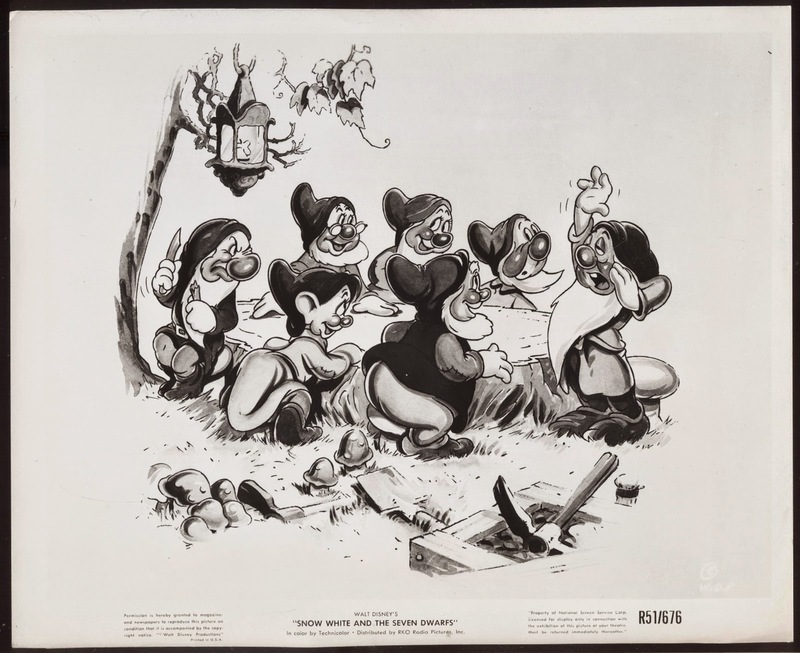 The same prints in slightly different frames are found on p.193 of the 1974 Disneyana book by Cecil Munsey. 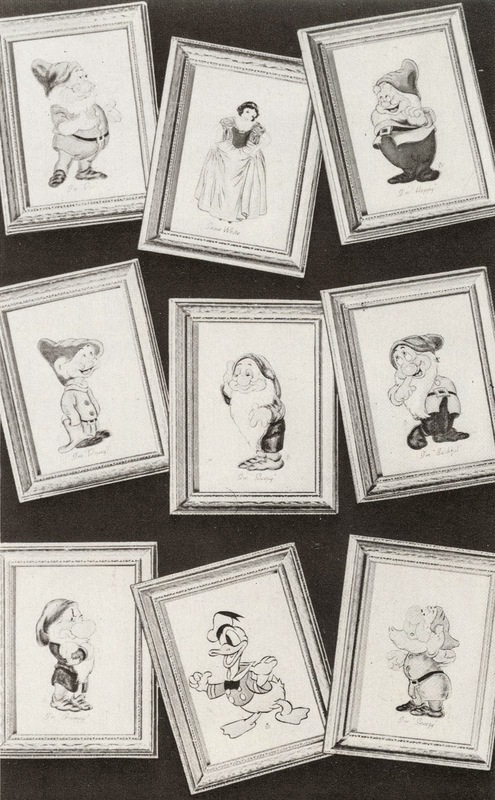 According to the author, they were "sold by Artisto, Inc. of NYC. 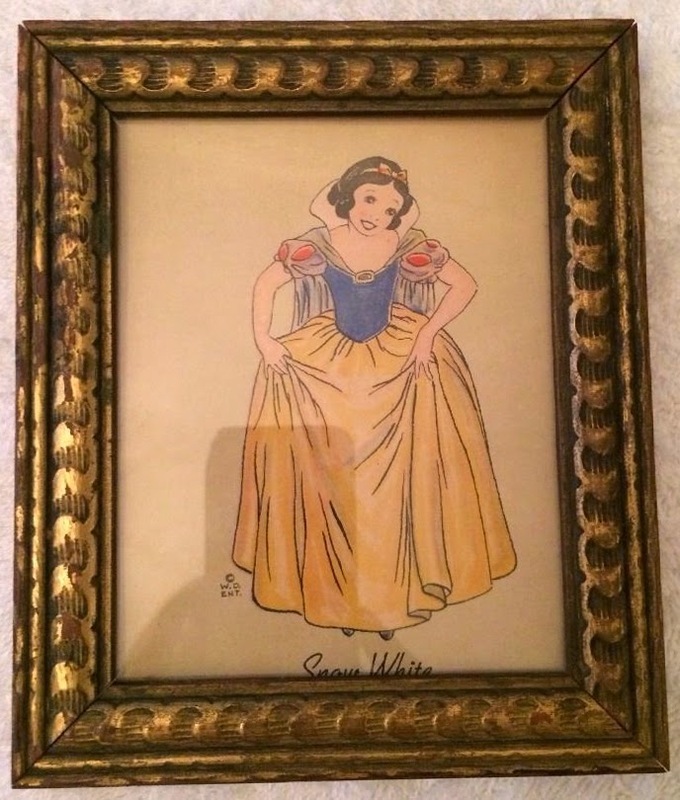 Each picture came with an antiqued frame in a box and retailed for 39¢." 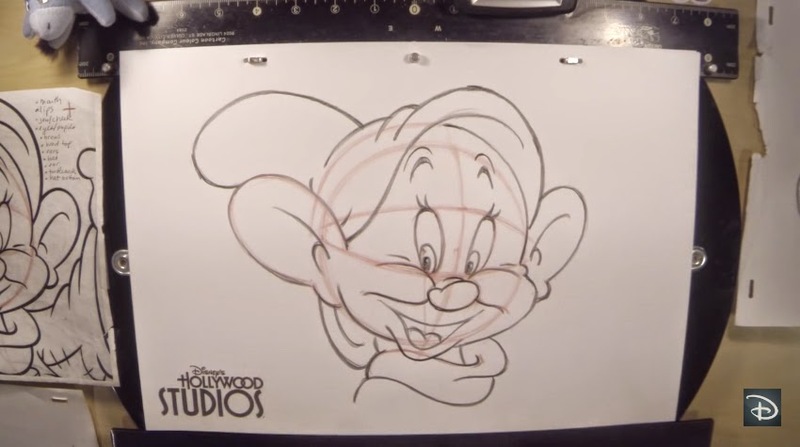 Other Disney characters were also produced. 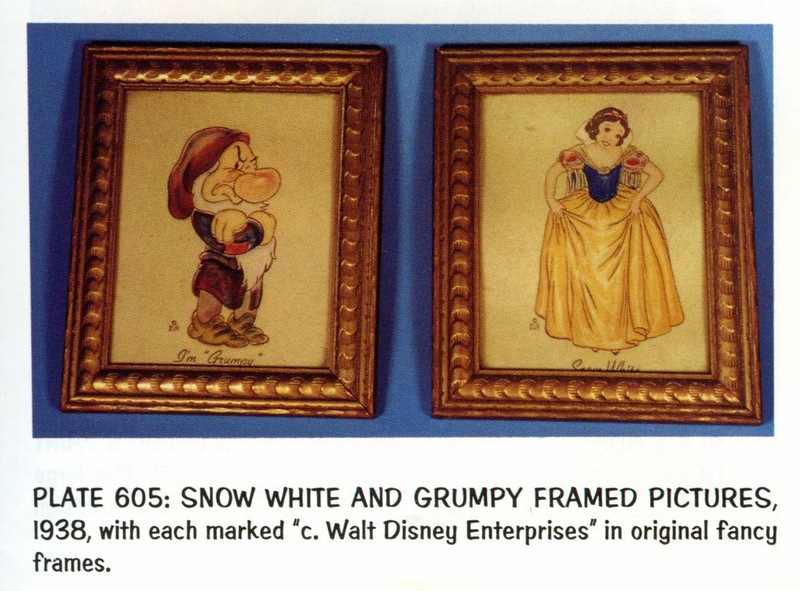 More frames are seen on p.149 of The Collector's Encyclopedia of Disneyana by David Longest and Michael Stern. The prints were issued in metal frames too. Metal frames via anthony's collectibles. The style of frame and material you got was probably dependent upon where and when the orders were placed and processed. Here's a few more examples. Additional images via legendary auctions.